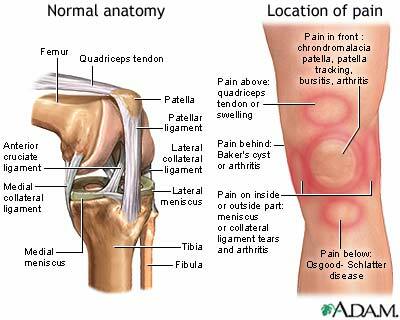 Anterior knee pain is pain that occurs in the front of the knee. Common etiology include disorders that have normal tracking of the knee cap either through translation laterally or medially by pulling the knee cap to the side thus resulting in misalignment of the knee cap in the normal group between the femoral head and the tibia resulting in abnormal tracking. – Tendinosis of the quadriceps tendon. Symptoms of anterior knee pain usually occur with pain below the patella or knee cap, and is made worse by deep knee bends or sitting for long periods. The femur is the long bone of the thigh, which articulates with the largest bone of the lower leg, the tibia. The patella, or knee cap, can contact the femur during tracking. This is a result of the muscular impact of the quadriceps tendon and the patellar tendon, as they insert superiorly from the patellar femoral insertion and distally to the patellar tendon insertion on the tibial tubercle. These may all result in chronic knee pain or arthritic processes to the knee. Fracture of the patella may occur in post traumatic conditions and can be diagnosed with radiographic studies, such as an X-ray or MRI. Osgood-Schlatter’s disease is an osteochondritis condition of the tubercle. It is usually seen in adolescent boys and frequently occurs in both knees. Its onset is subtle and the pain is tenderness, prominent at the tibial tubercle and is aggravated by exercises or direct pressure from kneeling. Osgood-Schlatter’s is characterized by swelling of the tubercle where the tendon attaches to the bone. During adolescence, the tubercle seems to be a weak link in the quadriceps mechanism and can be visualized by radiographic studies, including x-rays, MRI or ultrasound. Where as Osgood-Schlatter’s disease is osteochondritis involving the distal aspect of the patellar tendon at the tibial tubercle and is more frequently seen, a much rarer condition known as Larsen-Johansson disease affects the proximal portion of the patellar tendon. It is also seen in adolescent boys and insidious in onset, with tenderness over the inferior portion of the patella, resulting in chronic knee pain. It is aggravated by exercise or stressing the patella. Larsen-Johansson disease is commonly referred to as “jumper’s knee” and is a common overuse injury in sports with repetitive jumping, such as basketball, and track and field. Osteochondritis dissecans results from a fragment of the articular cartilage with subchondral separating partially or completely from the joint surface. This results in a foreign body in the joint. Osteochondritis dissecans is found in children as an anomaly of ossification in adolescence (juvenile osteochondritis) and it can also be found in adults. Males seem to be more affected than females. It has an insidious onset with chronic pain, stiffness and localization that is non specific. Frequently, quadriceps muscle atrophy is noted in radiographic studies. Surgical intervention may be necessary, however, recent advances in visco supplementation, platelet-rich plasma (PRP) and stem cells make all of these options for conservative treatment. As the knee is a very complex joint, it requires a physician’s skill in the diagnosis of the precise cause of chronic knee ailments and the various treatment options available. Newer treatment options, such as platelet-rich plasma (PRP) or stem cell therapy, have to be considered in the clinical setting in juveniles or adolescents, versus surgical intervention due to anatomic misalignments. However, the future of platelet-rich plasma (PRP) and stem cells show remarkable possibilities in advancing future treatment options for conditions that otherwise have limited recourse. With platelet-rich plasma (PRP) , the healing or growth factors in a person’s own blood are captured and injected into the knee. This may help to heal and regenerate the damaged knee segment. Additionally, stem cell therapy may help regenerate the injured cartilage. Stem cells can be processed from a person’s abdominal fat cells or bone marrow. Once processed, the stem cells are directed into the injured area using a variety of techniques. If you continue to suffer with chronic anterior knee pain and your current treatment plan leaves you wanting more options, perhaps a fresh set of experienced eyes can change your outlook. Since 1990, Dennis M. Lox, M.D has applied his personal interests in sports medicine, cutting-edge regenerative medicine and chronic pain management to helping patients increase their quality of life. Contact us for an appointment at 727-462-5582.